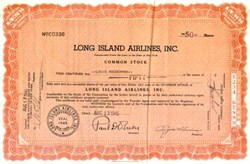 Beautifully engraved certificate from the Long Island Airlines Corporation issued in 1946. This historic document was printed by the Hamilton Bank Note Company and has an ornate border around it. This item is hand signed by the Company's President ( Royce Grimm ) and Secretary ( Paul O'Brien ) and is over 58 years old. We are also including the company's 12 page IPO prospectus. This is the first time we have seen this for sale. Long Island Airlines was formed under the laws of the State of New York on March 20, 1946. Its principal business office is located in Southampton, New York. It was the purpose of the Long Island Airlines to offer to these communities of Montauk Point, Southhampton, Easthampton and Westhampton a much-needed commuters� service, from May 15th to October 15th, with the most modern amphibious equipment available, with a schedule calling for five non-stop flights daily each way to Montauk Point and six non-stop flights daily each to Easthampton, to Southampton, and to Westhampton. As soon as they are made available a plane will be assigned for non-stop service to each of these communities. Flying schedules as presently contemplated range from 25 minutes on the New York-West- Hampton flight to 40 minutes on the New York-Montauk run. Rates have not as yet been fixed but will be in keeping with the luxury service offered. The New York metropolitan area base initially selected is at 23rd Street and East River Drive, which is within 10 minutes driving time from Broad and Wall Streets, the heart of the financial district, and Fifth Avenue and 59th Street, the midpoint between the residential and shopping districts of New York City. As hereinafter stated under the heading �Equipment�, it is intended that, when available, Grumman Mallards carrying twelve passengers will be the standard equipment for the Line. The home port of the Line, as well as its Westhampton-Riverhead terminus, is expected to be the Suffolk County Airport. Negotiations are under way for the purpose of enabling the Corporation to use this base and the Corporation has been advised that when and if the Suffolk County Airport is returned to the County by the Federal Government, its application will be given consideration. At no point is the landing terminal more than five minutes driving distance from the community which it serves. Transportation service will be provided from all terminal points to the respective communities. In due course, the Corporation intends to file an application with the Civil Aeronautics Board for a Certificate of Public Convenience and Necessity for scheduled service from New York City and Long Island points, to Block Island, Nantucket, Martha�s Vineyard, Hyannis and Newport. The Corporation is informed that at least one regularly scheduled airline now operates between New York and several of these New England points. There may be other applications pending covering this same service. There is no assurance that the application of the Corporation for this scheduled route will be granted by the Civil Aeronautics Board. The service between New York City and eastern Long Island points is, as hereinabove stated, limited to the summer season, May to October. Plans have not yet been completed as to utilization of the Corporation�s planes and personnel for the winter season but it is likely that winter service will be transferred South so as to utilize as fully as possible the luxury equipment. It is not intended to do charter or contract work during the winter months but rather to establish fixed working schedules such as Miami to Key West or service in the Islands of Puerto Rico. Winter projects are presently being given careful consideration by the officers and the Board of Directors. The present intention of the Line is to use Grumman amphibian planes exclusively since they seem to be so well adapted to the requirements of the Corporation�s operations. The Grumman Corporation is the builder of the famous Hell Cat, Wild Cat, Tiger Cat and Bear Cat planes of Navy renown. The Grumman Widgeon plane, an amphibian plane, which is now available for delivery, seats 4 passengers and is the plane initially to be used by the Corporation. It is the present intention of the Corporation to acquire, as soon as practicable, Grumman �Mallard� planes, which are amphibion planes, modern in every respect, with a seating capacity of twelve passengers, pilot and co-pilot, and including complete toilet facilities and ample baggage space, powered with two Pratt & Whitney 600 HP engines. The cost of the �Mallard� and a spare engine is approximately $98,000 while the �Widgeon� is priced at about $32,000. Delivery of the first �Mallard� is expected some time in July. Sufficient of the proceeds of the sale of this issue will he held in escrow by Irving Trust Company to pay for the �Mallard� provided satisfactory delivery of the plane is made. The Corporation has received the right from the Town of Easthampton to use the waters of Lake Montauk �for commercial airline service, and * * * that in connection with the premise, this Board, its successors, and the Town of Easthampton, shall grant no franchises or privileges to any commercial airline carrier elsewhere in said town without first giving said Long Island Airlines immediate notice of pendency of said application, together with the right to attend all hearings and deliberations thereon* * * and in the event that said Long Island Airlines shall offer to duplicate and shall duplicate said service, then it shall continue to have exclusive service in said Town of Easthampton, the same being granted as above specified in order to induce said Corporation to pioneer and institute the airline service above described�. The Corporation is to have the use of these waters for a period of three years without charge, and with the charge of ten cents per passenger landed from New York thereafter for the duration of the contract, which is to run for a period of twenty years from April 15, 1946. The Corporation has received from the Montauk Beach Company a letter outlining the general terms of agreement to provide a site for a seaplane ramp adjoining the premises of the Montauk Yacht Club for a period of ten years, at a rental of $1 per annum, the Corporation to construct a seaplane ramp suitable for the landing of a seaplane of at least 12,000 pounds. The Montauk Beach Company agrees to contribute $2,000 toward the cost of construction of this ramp. It is estimated by the Corporation that the total cost of this ramp will be in the neighborhood of $5,000, of which the Corporation will pay $3,000. The Corporation has received from the Town of Easthampton the right to the use of the landing areas of the Easthampton Airport for a period extending to October 16, 1948. This agreement provides for annual payments to the said Town of $1,000 and the undertaking by the Corporation to maintain regular air passenger service with at least one scheduled flight each day unless impracticable for reasons beyond the control of the Corporation. The Village of Southampton, pending construction of a �municipal airport�, has designated a temporary municipal landing place for the planes of the Corporation in the waters of the Township at Shinnecock Bay and has obtained from the Town Board the right to the Corporation to use such water landing. The Corporation has entered into a contract with The Incorporated Village of Southampton which, among other things, gives the Corporation a lease on Old Fort Pond (Southampton) for use as a seaplane base for a period of three years at an annual rental of $1,000. The Village agrees to construct, at its expense a seaplane ramp designed to beach aircraft having a weight of 20,000 pounds, exclusive of passenger load, and also to dredge a suitable channel to the ramp. Construction of this ramp is now in progress. The Corporation is to operate the Airport under its lease and has agreed to furnish commercial airline services between Old Fort Pond (Southampton) and the City of New York upon a schedule and at such times as shall be reasonably satisfactory to the Village of Southampton in order to supply its residents with proper air transportation between such points. The Corporation also agreed to permit private planes to use such landing facilities and to provide usual and customary service as circumstances permit upon reasonable charges for landing privileges and service in so far as the same shall not conflict with the proper functioning of the Corporation�s commercial airline operations. There are further provisions for extensions of the lease upon certain conditions. The Corporation has received the temporary right, non-exclusive, from the lessee of Suffolk Airport, to use that Airport for taking on and discharging passengers at the prevailing rate of twenty cents per passenger. Hangar facilities are not available at this Airport. Negotiations are under way for the purpose of enabling the Corporation to use Suffolk County Airport, both for taking on and discharging passengers and also for the use of hangar facilities. The Corporation has been advised that when and if the Suffolk County Airport is returned to the County the heart of the financial district, and Fifth Avenue and 59th Street, the midpoint between the residential and shopping districts of New York City. The names and addresses of the directors and executive officers of the Corporation are as follows: Name	Address	Office Royce Grimm Southampton, New York	President and Director Guy Lombardo Freeport, New York	Vice President and Director Paul D. O�Brien 152 West 42nd Street,	Secretary and Director New York, N. Y. William B. Platt, Jr Southampton, New York	Treasurer and Director John F. Hutchinson Southampton, New York	Director Charles W. Stevens 52 Wall Street,	Director* New York, N. Y. Albert W. Bianchi 52 Wall Street,	Director** New York, N. Y. * Charles W. Stevens has not yet been elected a Director of the Corporation but is expected to be so elected upon the conclusion of this financing and upon appropriate amendment to the By-Laws to increase the number of directors. He has agreed to serve if elected. Mr. Stevens is a partner of the firm of L. H. Rothchild & Co., the Underwriter named in this Prospectus. His firm may also participate in the Selling Group. ** Albert W. Bianchi has not yet been elected a Director of the Corporation but is expected to be so elected upon the conclusion of this financing and upon appropriate amendment to the By-Laws to increase the number of directors. He has agreed to serve if elected. Mr. Bianchi is a partner of the firm of Pyne, Kendall & Hollister, members of the New York Stock Exchange. His firm has an agreement with the Underwriter to be paid a finder�s fee or commission in connection with this financing amounting in the aggregate up to 25% of the net underwriting profits which accrue to the Underwriter and up to 25% of the Warrants which are acquired by the Underwriter. His firm may also participate as a member of the Selling Group. The Directors of the Corporation receive no remuneration as such. The Corporation has agreed in the Underwriting Agreement that the salaries of the three chief officers of the Corporation shall not exceed an aggregate of $15,000 annually for the first two years of operation. The President, Royce Grimm, from 1940 to the end of 1941 was a Director of Publicity for Piper Aircraft Corporation; for the next eighteen months was associated in a personal capacity with William T. Piper, Sr., President of Piper Aircraft Corporation; for a period of approximately two years thereafter was associated with Lowell Thomas in newspaper syndicate work; thereafter, to July 1945, headed his own newspaper syndicate; thereafter, to date, has devoted his activities to organization and development work in connection with Long Island Airlines, Inc.
John F. Hutchinson will be in charge of operations. He came to this Corporation from American Airlines where he spent six years in various capacities, including that of Instructor in Operations Train ing School. Guy Lombardo, Vice President, musician, band leader, partner in Loinbardo & Rappelye, which has Higgins Boat Agency for Long Island, Westchester, Florida and Cuba. Paul D. O�Brien, Secretary, is a member of the law firm of O�Brien, Driscoll & Raftery (counsel for the Corporation). William B. Platt, Jr., Treasurer, has his law office in Southampton, N. Y.